Visitors flock to Washington County to get a glimpse of a colorful combination of birds. 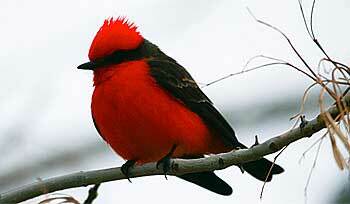 The St. George Winter Bird Festival is an event with a lot to offer. It gives those from the northern part of the state a chance to escape the cold and head to Washington County for some sunshine and warmer weather. The area is one unlike any other in Utah. Washington County is situated on the edge of the Great Basin, the Colorado Plateau and the Mojave Desert. Each of these diverse geological provinces has a corner in the county. Vermillion fly catchers are among the birds you'll likely see at this year's Winter Bird Festival. The wildlife here, particularly the birds, is a colorful combo of what you would expect to see in all three. That means that you could spot a pinion jay and a phainopepla in the same area. You could see a goshawk and a roadrunner within a few miles of each other. Just the other day I drove through an agricultural area near St. George and saw something I’d never expect in Utah: a white-tailed kite, sitting in a tree and begging to be photographed. 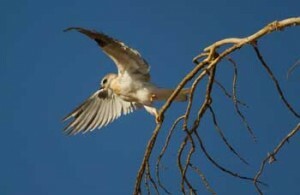 White-tailed kites are usually found along the west coast and the Gulf of Mexico. They are a medium-sized bird of prey that hunts grasslands and feeds on insects and mice. I can only imagine how the beautiful bird ended up in Utah. This white-tailed kite, photographed in Washington County, was a long way from home. I got out of my car and moved in fairly close—it’s exciting to capture photos like this in my own backyard. This guy will be a draw for those who attend this year’s festival. The festival begins on Thursday, January 26. You can register online at Saint George City’s website. Join us and get a different perspective on birds and wildlife in Utah. Hi, This message is for Lynn. We are publishing a general-interest visitor guidebook for Red Rock Canyon in southern Nevada. We’d like to license one of your ringtail photos for use in the book. At your request, I can send the page where we’d like to use the photo for your review. The book will be all color, 208-5.25″x8.5″, and have a print run of 5000. There will likely also be a smartphone app with the same content later on.